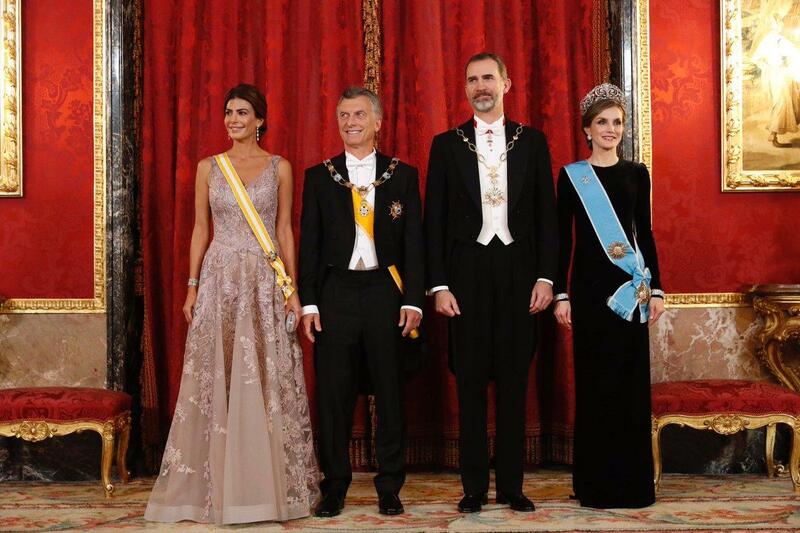 The King and Queen of Spain welcomed the President and First Lady of Argentina to Spain for a state visit today, and hosted a state banquet in their honor. CHECK. OUT. THAT. TIARA!!!!!!! Queen Letizia went all of 2016 without wearing a tiara, but she does wear tiaras at home when hosting state banquets, which gave her an opportunity to come back with a BANG in 2017. The Fleur de Lys Tiara, known as La Buena, is the resident big gun diadem in the Spanish jewel vault. Made by Ansorena, it was a wedding present from King Alfonso XIII to Queen Victoria Eugenia in 1906. The fleur de lys symbol depicted in the tiara is a symbol of the House of Bourbon. This is Letizia's first time wearing the Fleur de Lys Tiara; it was last seen in 2014 on Queen Sofia for the last state visit of King Juan Carlos' reign. It's among those jewels designated to pass from queen to queen per Queen Victoria Eugenia's will (the "joyas de pasar"). The large diamond earrings and hefty double diamond bracelets are also part of that group, and this is also Letizia's first time wearing those. When she goes big, she GOES BIG. I don't know about you, but I'm SWOONING. She totally carries off this enormous tiara. Regal to the max. Man, this week is trying so hard to break my keyboard.